The recent spike in oil prices could spell more trouble for ultra long-haul routes, which airlines have struggled to maintain due to poor operating economics and the recent global economic downturn. Singapore Airlines (SIA) this week decided to again cut its non-stop all-business class Singapore-Los Angeles operation from seven to five weekly frequencies. The new cut, which will be implemented from 03-May-2011, comes only six months after SIA restored daily flights on the route. SIA’s non-stop services to Los Angeles and Newark, operated with A340-500s, are the two longest non-stop routes operating in the world today. SIA had to adjust capacity on both routes several times since they were launched in 2004 in attempt to retain the routes and its niche fleet of five A340-500s. In 2008, both routes were changed from a mixed configuration consisting of 117 premium economy and 64 business-class seats to an all-business configuration consisting of only 100 seats. SIA at the time said the change was in response to demand for more business class seats on the non-stop flights. But it is believed in the first three years of the operation SIA discovered the economy class yields were too low to sustain a mixed configuration. From purely a load factor standpoint the mixed configuration flights was successful. According to US Bureau of Transportation Statistics (BTS) data, the Newark-Singapore flight had an average load factor of 76% in 2007. But the extraordinary length of the flight created unusually high operating costs, driven by fuel carrying costs and the need for extra crews. These costs can only be offset with a high load of high-yield premium passengers. In late 2008, as the global economic downturn began to affect premium-class travel, SIA struggled to get the yields and loads needed to maintain the non-stop Los Angeles and New York services. In response, SIA cut back both routes from a daily service to five weekly frequencies starting Feb-2009. The reduced schedule, initially slated to run for only six weeks, was extended several times. Daily service was finally restored on the Newark route in Jan-2010 and on the Los Angeles route in Oct-2010. BTS data shows SIA struggled to fill the Newark flights in late 2008 and early 2009 despite promotional efforts, including unusual fare discounts and unprecedented reduced mileage redemption tickets. 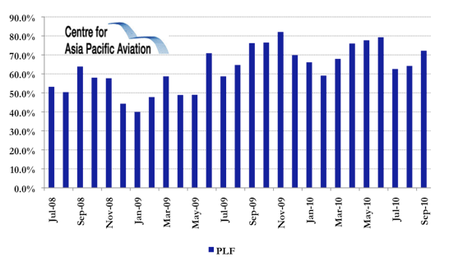 From Dec-2008 through May-2009 load factors were below 50% five of the six months. But the load factor improved over the last seven months of the year, reaching a high of 82% in Nov-2009, prompting SIA to decide to restore daily servicing from Jan-2010. SIA ended 2009 with an average load factor of 61% on the Newark to Singapore sector and through the first nine months of 2010 it had a more sustainable average load factor of 70%. Data for the 4Q2010 and 1Q2011 is not yet available given the six month lag in BTS reports. Newark-Singapore, which is over 18 hours in both directions, has had the distinction of being world’s longest non-stop flight as measured by both distance and travel time since it was launched in Jun-2004. Traffic and load factor data for the Los Angeles-Singapore non-stop flight, which is currently the world’s second longest flight, is not readily available. But data for SIA’s entire Los Angeles operation, which also includes one daily one-stop flight via Tokyo Narita, shows overall traffic from LAX was down in the 4Q2008 and all of 2009 before recovering in 2010. For 2009 SIA’s average load factor on flights out of Los Angeles across all classes of service was 67%. Through the first three quarters of 2010 the average load factor was 79%. SIA currently operates B747-400s in three-class configuration on the Singapore-Tokyo-Los Angles route. It was planning to switch this service to the larger A380 on 27 Mar-2011 but following the earthquake and tsunami in Japan, which significantly impacted demand on travel to from Tokyo, SIA decided to temporarily stick with the 747-400. SIA is now planning to switch to the smaller B777-300ER on this route from 16 Apr-2011. On the Singapore-Los Angeles non-stop route SIA for now is slated to operate the reduced schedule until late July with the Tuesday and Wedneday frequencies, which have the lowest demand, not operating. SIA says a decision will be taken within the next couple of months on whether to extend the reduced schedule. Last time SIA cut back to five weekly frequencies on the Singapore-Los Angeles route, the reduction ended up sticking for 20 months. Overall SIA has seen its performance on US routes improve since 2009. SIA’s average US load factor in the first three quarters of 2010 was 80%. In 2009 it was 70% and in 2008 it was only 68%. SIA’s total US traffic has slipped in recent years after slightly surpassing the 1 million mark for four consecutive years in 2004 through 2007. While SIA has used capacity adjustments to retain for seven years the distinction of operating the world’s longest route, other airlines have struggled to sustain ultra long-haul routes. For example, Thai Airways International was only able to keep its Bangkok-New York non-stop service operating for three years - from to May-2005 July-2008. The route, also operated with A340-500s, was at the time the second longest route in the world, only slightly shorter than SIA’s Singapore-Newark service. Thai cited high fuel prices in its decision to axe the route, claiming load factors were high. As fuel prices increase again, the four-engine ultra long-range A340-500 becomes particularly costly to operate. Boeing’s ultra long-range widebody, the B777-200LR, has more attractive operating costs especially as fuel prices increase. But B777-200LR operators have also discovered high yields are needed to sustain ultra long-range flights. Air India, for example, is using six of its eight B777-200LRs on medium-haul routes to Europe and North Asia after discovering most routes between the US and India did not have high enough yields to support B777-200LRs operations. As fuel prices continue to increase more airlines are likely to axe, reduce frequencies or defer any consideration of launching routes which can only be operated with B777-200LRs or A340-500s. There are only a handful of routes left in this category, given the routes that have been cut in recent years and the better than initially projected operating specifications of the B777-300ER, which has lower unit costs and is now operating routes of 16 hours plus such as Dubai-Los Angeles.